Details : Ht 28" TET. Ev E-Mid. Re. Bl.6"
Clear yellow deep plum eye-zone and edge outlined in yellow gold. Limited stock - 1 per customer. 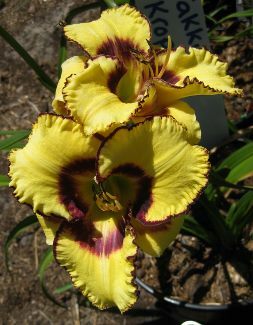 Jake Green - Exclusive to RB.D & Irises. Details : Ht 28" EV. TET. M Re. Bl 5.5"
Gorgeous recurved blooms of salmon pink with a large pale lime green throat and large cherry pink eye. Petals edged in deep red. Named for my lovely son Jake. Details : 26" SEv. Tet. M. Re. Bloom 6"
A deep black red-purple with a small green throat. Round, ruffled, overlapped with heavy substance. Limited stock - 1 per customer. Details : Ht 37" TET. Ev. E-M. Re. Bl 6"
This is a MUST for everyones garden, A gorgeous rounded pink with a huge red eye and edge and talll scapes. Puts on a FANTASTIC display when clumped! Prolific, reblooms in winter & vigorous! A favourite. Limited stock 1 per customer. Details : Ht 25TET. Ev. E-M Re. Bl 5½"
Pale Lavender with a bold black purple eye. 40 buds. Limited stock, 1 per customer. Details : Ht 28" TET. Late. Ev. Re. Bl 5.5"
Details : Ht 24" TET. Ev E. Re. Bl.4.5"
What a standout with it's red petals and lemon sepals. A wonderful bi-colour. Limited stock - 1 per customer. Striking blooms of plum-purple with white midribs. Large loose lightl ruffles. Vigorous and with proliferations. A very fast increaser - A popular purple. Details : 26" Ev. Dip. E - M. Bloom 6"
A cream-lavender-pink with a pale maroon eye and large green throat. Large, ruffled edges. Great substance - a favourite. 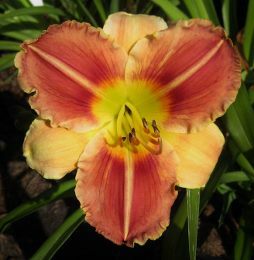 One of the loveliest pink daylilies. A rose pink with a darker rose halo and deeper lavender veining. Pretty. Limited stock - 1 per customer. Details : 22" SEv. Dip. M Re. Bl 5.5"
Pretty pink ruffled blooms with lovely form and substance. Details : Ht 30" Tet. Ev. E-Mid Re. Bl 6.75"
Details : 29" Ev. Tet. M. Re. Bl 5"
Lovely formed large ivory pink blooms with a large pale red eye, green throat, ruffles into the throat. Deep Red with a gold edged trim. Large blooms of deep rose pink with a paler watermark. White rimmed edging on petals. Lime throat. Many blooms and flowers over a long period of time. Details : 25" SEv. Tet. E - M. Re. Bl 4 - 4.5"
Clear pink blooms with a bright red eye and edge, edge. A small growing cultivar, good for borders. Details : Ht 34" Tet. Ev. Mid Re. Bl 7.5"
Large blooms with wide ruffled petals. Blooms start off as a peach pink then change to a soft delicate pink later in the season. Limited stock. Julia Ponte - Exclusive to R.B.D & Irises. Details : Ht 22" SEv TET. E-M Re. Bl 5.5"
This cultivar is a sibling to "Courtney Rose", but this is a pale clear rose pink with a raspberry eye & emerald - citron green throat. Neat, tidy blooms of great substance. Large ruffles. Named after one of my lovely nieces. Details : 25" Ev. Tet. E-M Re. 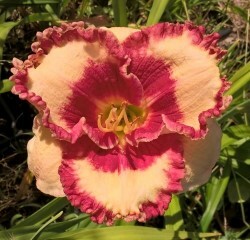 Bl 5"
A lovely ivory cream bloom with a large red eye and a 1/2" ruffled red edge with a fine gold picotee. Green throat. Details : Ht 24" Tet. SEv. E-M Re Bl:6"
Wide (up to an inch) showy burgundy and gold edges frame this outstanding bloom, while the big burgundy eye overlaying the custard cream base colour finishes it off. Green throat. Strong substance. Details : Ht 25" TET. Ev. E Re. Bl 5½"
Cream with violet black eye and a green throat. Ruffled. Details : Ht 26" TET. Mid Re. Bl 6"
Large rounded cream blooms of great substance. Gathered and pleated large ruffled edges.